Well here it is, my attempt at a Union Jack Battenberg! “EPIC” as my eldest son would say – or did say when I was making it last night! Rather stressful but worth the effort I think. Not one for the faint hearted! If you would like a simpler Jubilee Battenberg with a great wow factor, have a look at my May Recipe Post! Oh my! This is just about the most amazing cake I’ve ever seen. I wouldn’t attempt to make it but wow – just stunning! That is indeed epic. My friend is making one like this too. I’m going to send her a link. Looking forward to the other entries too. I’ve just submitted mine. 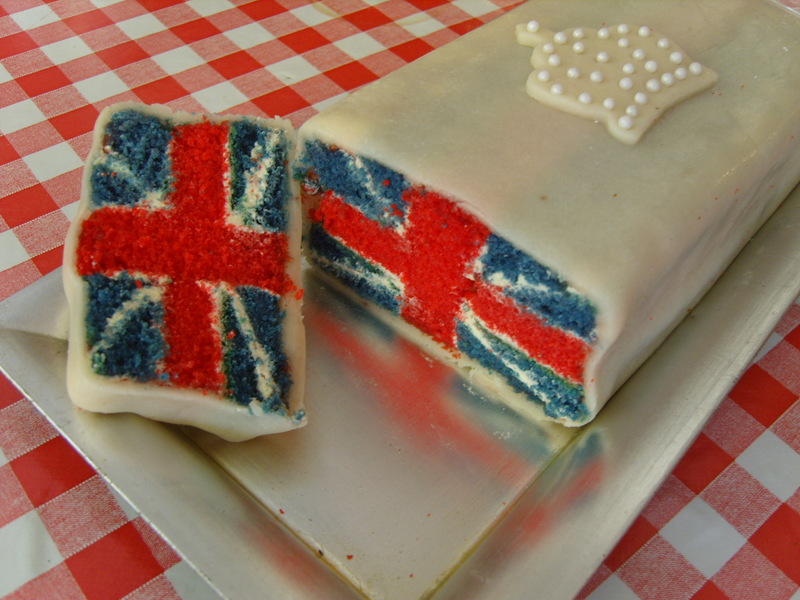 I’ve seen red and blue squares in a battenburg cake for the Jubilee but not an actual Union Jack! I’m very impressed. Thanks very much for entering my bloggers Jubilee baking competition. It’s based on my previous recipe for Jubilee battenberg. I made a larger red cake and did the top cut outs, then fitted the blue bits in, then I carefully turned it over before cutting out the next bits – if that makes sense! You have to use quite a lot of food colouring to get a definite colour in the mix before you bake, add a little at a time until you are happy. You must use paste colour though or your mixture will get too runny & split. Good luck! Can I ask, what did you use for the white bits? I have to congratulate you on your neat cutting! I attempted one myself last night, Overall I’ll reasonably happy, though my diagonal cuts are no where near as straight as yours and despite using half a bottle of blue food colouring it’s still only pale blue at at best! Do you happen to have the bakingelements.com guide saved anywhere? That website is kaput and I’d really like to make this cake in the near future but am a bit nervous of cutting without a guide. What is the ratio of red and blue batter? 50/50? Do you suggest using a Battenburg tin or just loaf pans? Any info you can give on the mechanics of this design would be greatly appreciated. Thanks and this is a great blog. I hope you will be able to do more posts soon! I used two loaf tins rather than a battenberg tin because I used the whole of the red cake to make the cross; you need slightly less blue than red. It is important to chill the cake really well before cutting as it really helps to hold it together. It is quite difficult to explain the process but I will try, hope it makes sense! I didn’t use a ruler but you can if you like. I think the best thing to do is have a picture in your mind about how it needs to look and take your time to make sure you get it right. To be honest, even if it is a bit wobbly and not perfect it will still be really impressive when you cut into it so don’t be too hard on yourself. I cut the red cake into an even oblong shape then made two cut outs at the top (above where the cross goes through the middle), leaving a red bar lengthways between. I used the smaller oblong bits I cut out to measure against the blue which I then cut to the same size and then cut diagonally through. I used white butter cream to attach these into the slots in the red cake. I then held it all together with cling film and re-chilled in the fridge. The next step is to turn the cake upside down and repeat the process. Re-chill the cake and then you are ready to glaze and cover with marzipan. Good Luck!